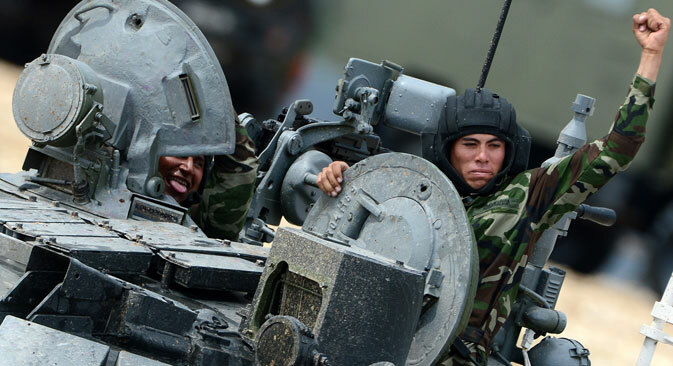 The tank biathlon team of the Nicaraguan Army at the International Army Games 2015, Alabino base outside Moscow. The International Army Games are held between July 30 and August 13 simultaneously at 20 training grounds, where 19 of them are at three Russia’s military districts: Western, Southern and Central: from Siberia to Kaliningrad in the west and from St. Petersburg to Sevastopol in Crimea. The teams of the Russian and Chinese military are on the first and second places, correspondingly, after the first six days of the International Army Games 2016, the competition’s chief referee Dmitry Gorbatenko told journalists on August 5. "According to the preliminary results, the Russian team, which is involved in different contests, is first. The team of the People’s Liberation Army of China is second, and Kazakhstan’s team is third. All the competitions have begun, and the contest is hot," Gorbatenko said. Thus, according to him, Chinese representatives have taken all the three first places in the dog handlers’ contest True Friend, as its second stage has been completed. In the Military Medical Relay Race competition among women's teams China has also taken the first and second places, Kazakhstan is third. In the competition among men's teams all the top places have been taken by the Chinese military. "The Russian team has been performing well in a number of competitions, however, in some contests our colleagues are winning, which shows that their training level is quite high, and we have still something to strive for," the referee said. Naval competitions take place in the waters of the Baltic, Black and Caspian Seas. This year, unlike in previous years, the Games take place in two countries - in Russia and in Kazakhstan. The Games’ program has 23 competitions in field, air and marine training. Eleven countries have sent over their representatives to observe the competitions. A total of 121 teams from 19 countries participate in 23 contests of the Games. The largest teams are from China and Kazakhstan. The Chinese military take part in 22 competitions, and the team from Kazakhstan - in 21. The Russian team is involved in all the 23 competitions. What’s new with the Russian army?